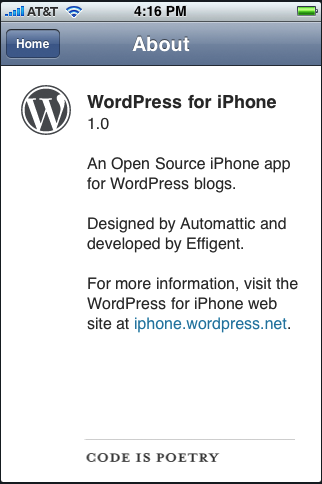 WordPress is finally out for the iPhone and it works great. There are a couple features missing but I’ll get to those in a minute. The app usually opens to a list of your blogs but the first time you need to select “Set up your blog” from the menu. Just enter the blog’s URL, your username and password, and select how many recent posts to show from 10-50.